Coral have small algae known as a zooxanthellae living within their tissues. These algae provide the food for the corals and have what is known as a symbiotic relationship with the coral, meaning that both the coral and the algae benefit from living together. 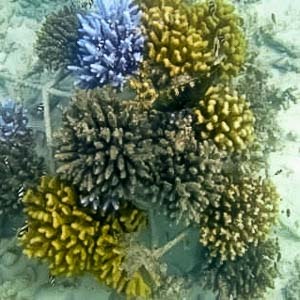 These algae also give the coral their colour. 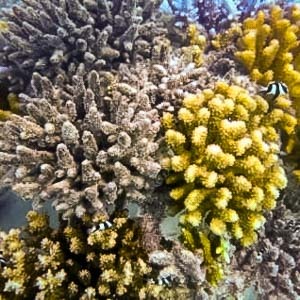 When the coral becomes stressed the relationship between the coral and the algae breaks down and the algae leave the coral; when this happens the coral become paler in colour or completely white depending on how bad the stress is: this process is called coral bleaching. By the end of the dry monsoon in April we were getting very hot and humid days with very little cloud cover in the skies and not much wind, very nice for lazing on the beach and swimming but not so good for the corals. These conditions cause the surface waters to increase. Normally the water temperature is around 30ᵒC but in April we recorded water temperatures of up to 34°C. This is too hot for the corals and causes them to become stressed and bleach and we saw evidence of this in the channel area and in the shallow parts of the House Reef. (See our updates from back in April for more details). We have been lucky that these temperatures only lasted for a few days and have now returned to normal. However, when corals bleach it takes time for them to gain their colour once more so we are monitoring one of the frames in the channel to see how long this process takes. The water temperature on the house reef has decreased drastically this month after almost two weeks of stormy weather at the start of May, marking the start of the southwest monsoon. 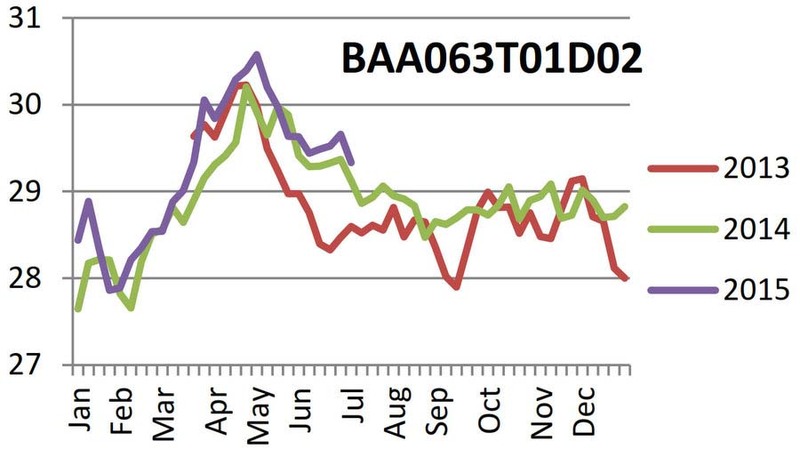 Ocean surface temperatures were a steady 31°C at the start of May, but dropped down to 28-29°C by mid-month. Pale and partial bleaching was observed throughout the reef on both the natural reef and on the frames, especially in the shallower areas (<2 m). 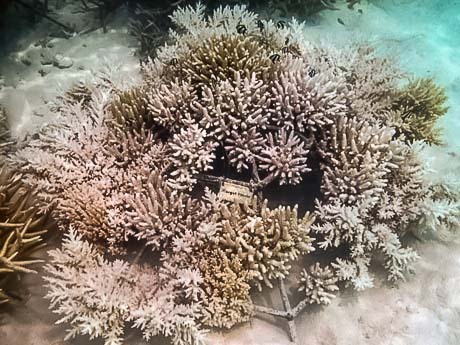 Only a little ‘total bleaching’ was observed, mainly in Acropora robusta and Acropora hemprichii. 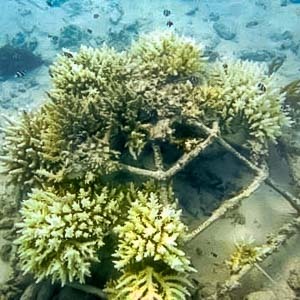 The 2015 coral bleaching event has been followed by a rapid drop in sea temperatures, and increased wave damage at the change in monsoon season has caused some mortality. This year has not been classified globally as a “mass bleaching event” (IUCN definition) as not all coral species have been affected. 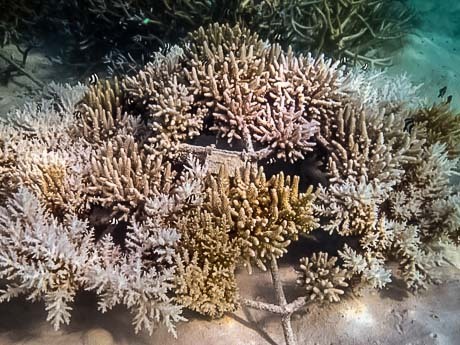 But certainly a large bleaching event has been seen in the Maldives, mostly affecting the Acropora species of corals. The shallower areas seemed most badly affected, in particular the Spa and Green Lagoon sites, which also have slow water currents with water pooling in the lagoon and subsequently heating up. The Water Bungalows, Turtle and parts of the Channel sites are also shallow but with much stronger currents flowing over them, and as such the bleaching was observed to be much less at these sites. We have stationed temperature loggers at various sites around Landaa Giraavaru, and you can see a graph of the readings below. Between mid-March and mid-May 2015, the ocean temperatures were the highest we have seen for several years, peaking at 30.5 °C. Our new marine biology Intern, Sebastian Szereday, is currently recording the bleaching event data and analysing the impact on the coral frames. The selected site for the study is the Water Villas Arc, which is well representative of the affected sites. For this study, we count the number of live fragments versus the number of dead fragments on each frame, to obtain a mortality rate. We then classify the frames by age, and we have noticed that the younger frames (<2 years) are far more affected by mortality than the older frames (>2 years). These results are displayed in the graph, clearly showing the 6-month frames with 80% mortality, compared to the 2 year frames which largely recovered. Our new marine biology intern, Sebastian Szereday (University of Vienna), is based at Landaa for 11 weeks, and will be assisting with our coral bleaching research. As part of his busy schedule, he will also be studying coral fluorescence and continuing with our coral frame biomass project.